Emma grew up in Japan. Though not born there, she considers herself Japanese, no matter what her skin color conveys. She spoke Japanese before English, and Japan has always been home. After her mother is diagnosed with skin cancer, the family moves back to the US for her treatment. Emma's upset, not wanting to leave her home country, her family and her culture. I absolutely love the open-minded portrayal of race and culture in The Language Inside. Emma's skin and heritage may be white, but her heart is Japanese. Not only is The Language Inside a diverse novel, but it highlights the fact that skin color really doesn't matter and embraces the differences. You might think Emma would fit in better in the US, but she doesn't. Her way of looking at the world isn't Western. For example, certain types of humor go right over her head. In a similar vein, Emma's volunteering at an old folks' home to help a woman with her poetry brings her into contact with even more experiences of culture. She befriends old Zena, who can communicate only with her eyes, and Samnang, a teen boy, Cambodian. The Novel Inside shows the depths of experience and identity within everyone. No one can be boiled down to just the country they came from or the color of their skin, and they can bond without language, whether using eyes or pictures or gestures. It's such a beautiful, important message. The writing, however, was not ideal for me. Not only is it the sort of verse without any real meter to it, but it's also written with limited capitalization and punctuation. THE HORRORS. Okay, so it wasn't terrible, but that will never be my preference and it did detract from the story for me as a reader. 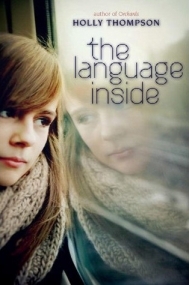 The Language Inside is a must read for those looking for more diversity in their young adult novels, particularly readers like myself who love stories set wholly or partially in Asian culture. Even though I'm not personally a huge fan of verse novels, I still highly recommend The Language Inside.